Las Palmas is a spacious, contemporary St.James west coast villa refurbished in May 2014 with 3 bedrooms, 2 bathrooms located in a private road and is a short 2 minute walk to Paynes Bay beach. The villa is approximately 500 metres from The Sandy Lane Hotel and One Sandy Lane. The property has a contemporary feel. Las Palmas is centrally located within easy access to the highlights of the west coast. The property boasts its own jacuzzi in the private landscaped gardens of Las Palmas. 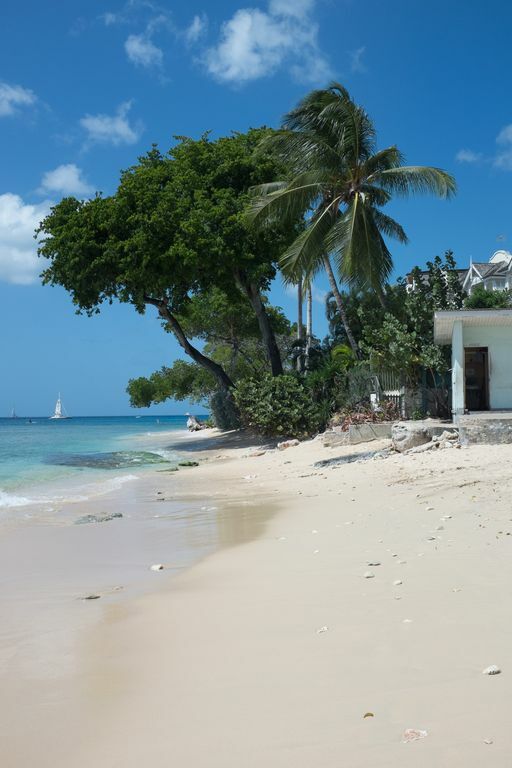 Las Palmas is one mile from Holetown and 10 minutes drive from the popular Mullins Beach, 15 minutes from Speightstown. It is close to numerous restaurants.Amenities include 3 bedrooms (one super king, one Queen and two twin beds), 2 bathrooms (one en suite), fitted kitchen, sunken living room with maple wood floors, covered patio with bar, fridge and seating area. The property is air-conditioned and has ceiling fans throughout. Short and long term rentals welcomed. Utilities fee charged per person per night to cover gas, water and electricity used during your stay. Car Hire: Car hire can be arranged via Villa manager Sharon Drakes. Maid Service: Maid service occurs twice per week by Daphne. The frequency of visit can be increased at a cost of BDS$80.00 per visit payable locally. Please note that on departure, should additional cleaning be required, this will be deducted from your security deposit. A starter food pack can be provided for guests on payable locally on arrival. Please confirm if this will be required to White Lilies Ltd. Please contact WhiteLillies directly for more information. Local amenities: Las Palmas is situated within a 5 minutes drive of the following amenities - Massy at Sunset Crest Shopping centre and Supercentre Supermarket, The Cliff restaurant, Cin Cin restaurant, The Mews, Spagos, Just Grillin, Mullins Beach, Batsrock Beach, Gibbs Beach. The Sandy Lane Hotel, Daphnes, The Cliff and The Tamarind Cove Hotel are all on the doorstep. Spacious, private, contemporary house with all the mod cons you need for your stay, creating a home away from home, a 2 minute walk to the most beautiful beach on the island- Paynes Bay, home to the plantinum hotels on the West Coast. Your own detached HOUSE with large spacious garden, private jacuzzi room and just a two minute walk to the beach! Hence providing privacy and security with convenience. Coconutz beach bar is a great stop off on the way home to watch the sunset on the porch with your own bar and mini fridge. There is a private jacuzzi room in the garden of Las Palmas ( see photo's) There is also a covered patio and bar, leading through to the dining room for evening drinks. Laundry/Utility room with washing machine, ironing board and iron. I-pod player in living room . We had a lovely two weeks at Karen's home on Holders Hills; enjoying cool breezes in the garden and relaxing soaks in the jacuzzi. Our favorite gathering spot seemed to be the dining/living area where there was plenty of space for games and meals at the table and cozy sectionals for lounging. Just a short walk to the gorgeous beach and a short ride to the grocery . . . the only concern was crossing the busy street to reach the beach (children will need to be accompanied.) Excellent hosting services by Sharon and her crew of housekeepers; she is always available and very responsive. The house is in a great location in Paynes Bay on the west coast with various restaurants and bars within walking distance and the beach less than 5 mins walk away - the Caribbean sea is beautiful. It's easy to get cabs around the area and the property manager will help with car hire and excusions. The kids enjoyed the jacuzzi and we all enjoyed sitting on the terrace. I'd thoroughly recommend a trip to Barbados and to use this house as your base. This was my home away from home...I loved the space, the decor, the little things that tell you that this house is loved and cared for. The living spaces make you want too stay inside, eating at the kitchen island, lounging on the sofa, or reading on the terrace...even though you are only 5 minutes walk away from a beautiful beach! All of the amenities you could ask for. Also, its just off one of the main roads of Barbados, so it makes it very easy to go anywhere, with loads of great restaurants nearby. Karen, Sharon and Daphne, thank you, it was exactly what me and my family needed. I just returned from a 6 night trip to Barbados staying at Las Palmas with some friends. We were there for a friend's wedding and we had an amazing time. The house was beautiful, spacious, and walking distance to the beach and other hotels. We rented a car which allowed us to explore the island every day. The kitchen had every amenity you would need, except a regular coffee pot (luckily we figured out how to use the french press lol). The bedrooms were nice and there was plenty of room. We had 2 married couples and 2 single people, so the house definitely accommodated all of us and made it very affordable. The hot tub was nice alol though it didn't get very hot. It was so humid down there that we still went in it and it was nice and refreshing. We all enjoyed our stay here and would come back in a heartbeat! Fully equipped and very clean. Fabulous stay, Sharon and Daphne were lovely and really helpful. Easy access to beaches and supermarkets. Will definitely stay again. Thank you Linda and please do come and stay again! Already looking forward to our 7th stay! Las Palmas is situated on the Platinum West Coast of Barbados in St.James, The villa is located close to the 5 star hotels, restaurants and tourist attractions. Approx 10-12 miles from the airport. The property is located in a private road, near all the 5 star hotels and attractions of Paynes Bay - The Cliff, Tides, Daphnes, Zaccios, The Mews The Beach House are all close by to the villa. The villa is located a short 2 minute walk from the beach and is in a quiet and private location. Golf: Las Palmas is situated less than a 5 minute drive from the fantastic Sandy Lane Golf Course and 10 minute drive to the Westmoreland Golf Course, two of the islands best courses.